**NEW** Review feature – look who reads these Digests! The joy of an automated vehicle! 1.3 states that “The key objective is safety” yet there is no mention at all of cycles of any type and the first mention of people walking in the street is in 9.6. 5.14 states that you propose no mandatory training for users-in-charge of these vehicles, yet you accept that a user-in-charge might be checking emails. Drivers of standard vehicles are regularly to be seen on their mobile phone or are otherwise distracted from the task of driving. How would an observer distinguish between the two? 5.15 – 5.18 In these clauses you question the need for an Accident Investigation Branch. Such a body is most definitely required in our view and should investigate all road traffic accidents of a serious nature, and all incidents involving automated vehicles. Road Traffic Accidents occur daily on the roads of the UK, causing death and injury and all attempts should be made to reduce these incidents. 7.14 You accept that speeding offences may still occur. One of the main justifications for reducing the default speed limit in our towns and cities from 30 to 20mph is that road deaths and injuries are reduced in number and severity at lower speeds. 7.18 You tentatively (my emphasis) propose that it should be a criminal offence for a user-in-charge not to hold a driving licence, plus you go on to list 5 other misdemeanours for consultation as to whether or not they should be a criminal offence. This is an astonishing dereliction of duty. Road deaths and injuries are everyday occurrences in the UK and yet you pose the question as to whether someone completely unfit to drive could be a user-in-charge. 9.6 This is the first mention of human interaction with people outside the automated vehicle but then you ask whether there are circumstances where automated vehicles may mount the pavement or exceed the speed limit. Again, this is astonishing; you appear to have no cognisance of the death and injury caused to people who are walking or cycling by vehicles that mount the pavement and/or exceed the legal speed limit. In our letter of response, we also quote from an article that was in the Herald recently and a Christian Wolmar article in the current CyclingUK magazine. It’s short notice now but do email in your views if you can. Here is our excellent and very detailed response to the Govan Partick SDF, written by our committee member, Brenda. It’s a very thorough analysis – let’s hope Glasgow City Council take note of it! If you wish to use any of the content of either letter in your response, please do. Brenda has also written another excellent response, this time to the River Clyde SDF, and it is here . If you are so minded do please write in to support our views. These high-level documents set the stage for what comes next. Thriving on safe driving but not yet awake to safe cycling! This isn’t just for East Kilbride residents, as this invitation from the website details “If you live, work, do business or travel in East Kilbride, please get involved.” No doubt if you have ever cycled through East Kilbride, you will have found it a difficult place to navigate, so do complete the short survey. Questions are based round the three main locations you go to and then the options cater for most views. Late in the day, we have realised that this is a high level document and thus we have concentrated our response on the detailed Transport Options Report, see Item 1.5 below. This came in almost unnoticed, as an add-on to the Local Development Plan, and was only uncovered when GoBike members Richard and Tricia, were preparing for a meeting with East Dunbartonshire staff, which took place in Kirkintilloch on Wednesday 30 January. This is the link to the consultation. Richard and Tricia had a very productive meeting with the Acting Team Leader Traffic & Transport and the Transport Policy Officer. We are all very aware of the level of opposition there was to the Bears Way project and the support for private transport in the more affluent areas of East Dunbartonshire. Our response, which is here, does not shy away, though, from putting the active travel case. We have quite a few members in East Dunbartonshire, and many people from Glasgow and other areas cycle out to the area but many more feel the roads are too busy – do please let East Dunbartonshire Council know what you think by next Monday. 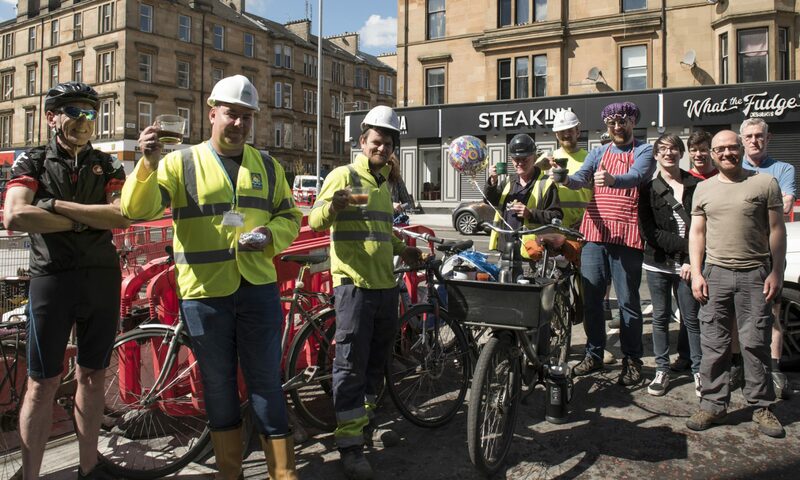 Hyndland, Hughenden and Dowanhill West were brought into the City’s restricted parking zones in 2017 and there was great disquiet because streets were made one-way with no exemption for bikes. Not surprisingly, as most of us know, one-way streets increase traffic speed, and so traffic speeds in this area are now over 20mph. Addressing this with a 20mph zone is very welcome. Please find enclosed a copy of the notice of the proposed Order, relevant maps, statement of reasons and detailed report. It is recommended that the Mandatory 20mph Zone is implemented alongside the proposed Restricted Parking Zone (RPZ) for Hyndland, Hughenden and Dowanhill West areas, together which are anticipated to improve parking, encourage walking and cycling, and enhance the general well being of the area. Details of the proposals are available on the Glasgow City Council website at www.glasgow.gov.uk/proposedtro from Friday 25 January 2019. As stated in the attached documentation, any person wishing to object to the proposed Order should send details of the ground for objection in writing to Andy Waddell, Director of Operations, Neighbourhoods and Sustainability, Exchange House, 231 George Street, Glasgow, G1 1RX or by email to land@glasgow.gov.uk by 15 February 2019. And here is our reply to the City Council, expressing support, but asking for the default policy of contraflow cycle lanes to be introduced to this area. There are just 2 questions, so there’s no reason not to respond! Do you have any other priorities to add to those previously identified, particularly any gaps? Do you have any other savings or income generating ideas to add to those previously identified? You might wish to raise priorities such as active travel and ensuring that footways/pavements, cycle routes and bus routes are gritted before other roads as well as income generation ideas, such as congestion charging, and parking charges all day every day except for those who through disability can’t walk, cycle or use public transport. Don’t forget a workplace parking tax levy and on the spot fines for traffic infringements. No doubt you can think of many more ways the City Council could raise money, while improving all things sustainable. 1.8 Connecting Woodside Phase 2 Consultations, events on 11 and 19 February, with responses on the Commonplace Map closing 03 March. “The next round of consultation for Connecting Woodside is now underway! This time, we are asking you about proposed improvements to North Woodside Road along with St George’s Road and Charing Cross (from West Princes Street to Sauchiehall Street). We have a range of ideas to improve both streets for people walking and cycling, including traffic calming and junction improvements on North Woodside Road and a segregated cycleway on St George’s Road – come along for a cup of tea and a chat to find out more and have your say. Did you come along in June last year and give your feedback about Garscube Road and North Woodside Road’s junction with Hopehill Road and Maryhill Road? Come and see how the designs have progressed based on your feedback. Information on North Woodside Road and St George’s Road will be available at both consultations, so feel free to drop into either one. Can’t come along to either event? Then you can view all the consultation materials here, and you can leave your comments on our Commonplace map here by Sunday 3rd March 2019. “Further to your e-mail of 27 January 2019, the University of Glasgow have developed plans to revised the traffic management arrangements on both University Avenue and University Place as part of their wider redevelopment masterplan. The proposals are for University Avenue to remain two way but with reduced parking and wider footways. I understand that on-road cycle lanes are be accommodated on the uphill side of the road but not on the downhill side due to physical constraints. It is also proposed to close of the vehicle access at the crest of University Avenue and create a wider pedestrian crossing. Vehicles will access the campus via the former Western Infirmary access on Dumbarton Road. Existing bus stops will be retained but relocated to suit the available space. University Place will remain accessible to pedestrians and cyclists but only authorised University traffic will be able to traverse from the adopted section, off Byres Road, to the private section at University Avenue. Parking in the adopted section will be reduced to six or seven disabled spaces with a loading bay on the north side. Existing residential access will be maintained. With regard to Public Consultation, DRS colleagues advise that planning approval was given on 29th October 2018. For your information the planning application reference for these works is 18/02000/MSC, the application can be viewed on the e-planning portal here. The University still have to promote a new Traffic Regulation Order to facilitate the changes to waiting and loading regulations, which will give you an opportunity to comment on the proposals. GoBike completely missed the Planning Application, but we will be looking out for the Traffic Regulation Order. Just what can the “physical constraints” be at a university with a major park and residential properties nearby, that mean cycle traffic can not be robustly provided for? Considering how this will link in with plans for Byres Road, why was there not a consultation beyond the vague visualisations shown several years ago? How can it be possible to not only NOT improve cycling provision around a university with its student population, but to actually REMOVE some of the existing not great provision, and replace it with nothing? We are livid about what we have seen in the plans and will be investigating. The discussion from this productive meeting is covered in Item 1.4, along with our response to the Transport Options Report. GoBike members went along to this event last week, you can see the plans and some images here . The junctions at the Clutha pub and the south end of King Street have posed some design challenges, and we would suggest that option 1 at the Clutha Junction would be less likely to cause conflict at crossing phases. There are some things the City Council needs to iron out on Bridgegate/Kings Street junction near the railway bridge, where space is very tight. Due to the car park on Kings Street, they feel they need to keep the two lanes of traffic going north on Kings Street. At the drop in, Sustrans had displayed an alternative suggestion to the existing “shared space” suggestion the council have put forward for this junction, that keeps people on bikes and people on foot visually separated, and we would lend support to this option. We would hope to avoid designs that use shared space at such tight junctions. There was some opposition from some local residents to the loss of car parking on Bridgegate, despite there being a large car park just across the street and car ownership in this part of the city centre being only 25%! Our continued support for this scheme is going to be important. GoBike expressed concern at this event about the treatment of side roads on these new cycle routes, not just on the South City Way but on others. The view is that when the adjacent road is continuous, cycle routes MUST also be continuous across side roads. If this isn’t the case people cycling are slowed down too much and the route loses it’s effectiveness. To remain safe it does need to be made clear to motorists that their stop/give way line is before the cycle lane. Thank you for your correspondence regarding the above named Traffic Regulation Order on behalf of Go Bike. Your general support for the scheme is welcome and your suggestion on improvements which could be made is noted. With regard to West Nile Street the intention is that this will form a north / south cycle route through the City Centre. This aspiration is included in the current City Centre Transport Strategy and will be progressed once funding becomes available. It will be considered as part of the on going re-emphasis away from streets dominated by private cars to being more attractive for pedestrians and sustainable transport. In the meantime the removal of general parking spaces and replacement with disabled spaces should reduce the volume of vehicles looking for a parking space. As previously advised the possibility of introducing a two way cycle route on Jamaica Street and Union Street has been investigated and is not being taken forward currently due to issues servicing the commercial premises on these streets and the negative effect it would have on the reliability and journey times of buses using this key public transport corridor. Once again thank you for your comment with regard to these proposals I shall write to you again and advise of the outcome. So there is some good news in there about West Nile Street, but the refusal to have good cycle connections to Central Station is deeply disappointing. GoBike supports the proposal to introduce traffic calming and extend the 20mph speed limit both on Maxwell Avenue and to the surrounding residential area. We have though, asked that the 750mm cycle bypass at each road hump is increased to 1200mm. Here’s the letter of support that we sent to East Dunbartonshire Council. The Water Row Masterplan was published today. Find out more about the exciting plans here. Download the Water Row Newsletter January 2019. Thanks for taking an interest in Govan’s ongoing regeneration. Please know that your privacy is important to us – find out more in our attached Privacy Statement. You can unsubscribe from our mail list at any time by replying STOP. 3.6 **NEW** Review feature – look who reads these Digests! Good to end on a high point! We’ll have another Digest for you in a couple of weeks.